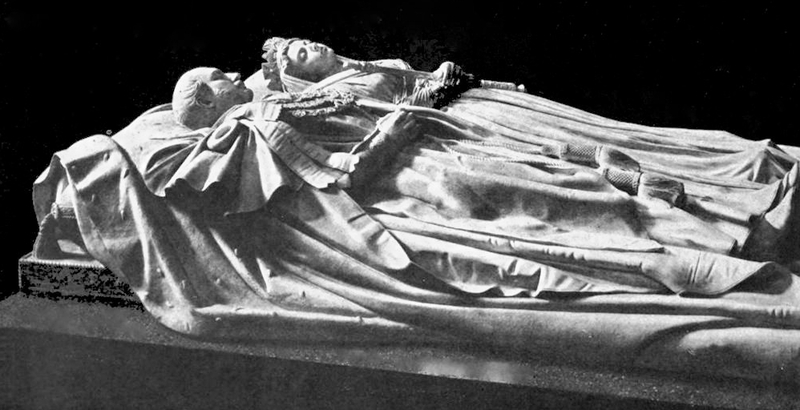 The Queen Victoria and Prince Albert Sculptures at Frogmore Mausoleum, Windsor by Baron Carlo Marochetti (1805-1867). 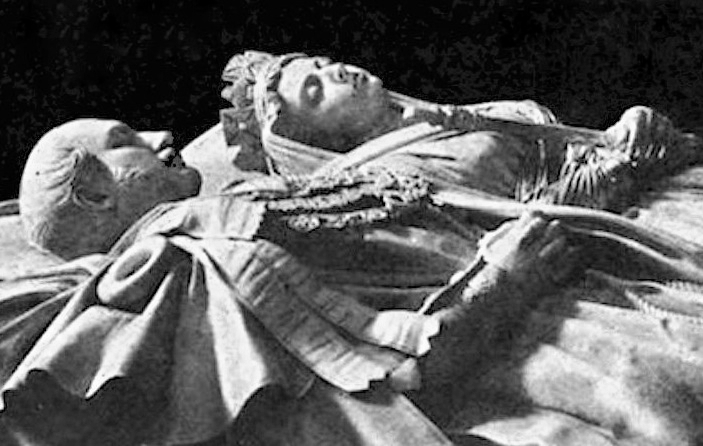 Begun soon after the Prince's death in 1861, carried out with the help of William Theed's death-mask of the Prince, and with the advice of his eldest daughter Victoria, Prince Albert's effigy was finally installed in the mausoleum in 1868 after the sculptor's own death in the previous year. The Prince is shown in his Garter Robes, under which can be glimpsed his military uniform. "The robes demonstrate the Prince's high rank, yet there is a softness, augmented by the ermine mantle on which he is lying, and a sense that the viewer has come across someone asleep" (Marsden 441). The sculptures are of marble on an Aberdeen granite block. Source: Whates 12. Close-up of upper parts of the effigies. The Queen commissioned her own likeness from Marochetti at the same time, as a companion piece (see "Prince Albert"). This of course was not installed until after her death, four decades after her husband's, in 1901. She too seems merely asleep; in a tender touch, the young couple's heads are slightly inclined towards each other. Marsden, Jonathan, ed. Victoria & Albert: Art & Love. London: Royal Collection Publications, 2010. "Prince Albert." The Royal Collection. Web. 6 May 2014. Whates, Harry Richard. The Life and Times of Edward VII. Vol. IV. London: Cassell, 1910. Internet Archive. Uploaded by the University of Toronto, Robarts Library. Web. 6 May 2014.